When Sakharov was awarded the Nobel peace prize for his advocacy of human rights the regime forbade him to travel to accept his award; Bonner, in Italy for medical treatment, risked the regime’s wrath by going to Oslo to accept the award. When the Soviet Union signed the Helsinki Accord in 1975, Bonner became a co-founder of the Moscow Helsinki Group to hold the regime to its promises. When the regime tried to silence her husband by exiling him to Gorky, a remote city off-limits to foreigners, she defied them by serving as his communications lifeline, traveling back and forth between Gorky and Moscow to bring out his writings. For this she was arrested and convicted of “anti-Soviet agitation and propaganda,” and exiled to Gorky, where she was kept largely out of the public eye until Gorbachev allowed her and Sakharov to return to Moscow. Even the collapse of the Soviet Union did not end her witness. 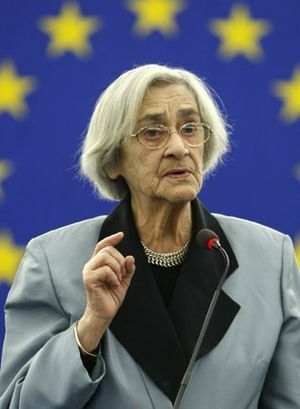 She continued to speak out on democracy andhuman rights in Russia, joining the defenders of the Russian parliament during the 1991 attempt by hard-liners to overthrow the Gorbachev government, and stood with Boris Yeltsin when the Army tried to take over in 1993. She later became a vigorous opponent of what she called “genocide of the Chechen people,” and just last year was the first to sign a public demand for Putin’s departure. Bonner showed courage that’s beyond imagination in relentlessly opposing a totalitarian regime that had done unspeakable things to her family. When we quake at the prospect of telling the boss—or a friend—what we really think, we should remember Yelena Bonner and how she spoke up, no matter her fears and the power she was opposing. This entry was posted on June 20, 2011 at 5:31 pm and is filed under Ethics-general, Government, International, Tolerance. You can follow any responses to this entry through the RSS 2.0 feed. You can leave a response, or trackback from your own site.